If I asked you how are you going to grow your business next month, next quarter, or next year what would you say? Chances are good that your solution to this problem is to either advertise more, spend more on advertising, or run more sales and promotions. Increasing your advertising budget is not a growth strategy. While this might help you increase your sales, this is not a real growth strategy. Actually, it’s more like an illusion. Sure, ads help you temporarily spike your sales by getting an ad in front of a shopper at the right time, but that strategy will soon become impossible. The further you remove yourself from your core audience, the more you pay and the worse your conversions get. When you look at it that way, there is clearly no economy of scale in online ads. In fact, online ads actually give you diminishing returns. As if diminishing returns weren’t bad enough, there are other trends in online advertising that are not favourable for any online business right now. Your advertising budget this year will get you significantly less than it did last year. That is because online ads are outpacing the inflation rate by about 5x. "Online advertising costs in America are outpacing the rate of inflation by 5x." The increase in the cost of advertising is not specific to one source/medium, either. CPC across almost every channel is on the rise. Online advertising CPCs have been steadily inclining for a few years now and the reason why comes down to simple economics. As tools like Shopify and Bigcommerce make it increasingly easy to start an ecommerce business, you have an influx of new business coming online and competing for market share. This increase in business has not been met with the same increase in the number of customers looking at them. Supply and demand dictates that this imbalance drives the price of each ad up. This is evident in the chart above. Businesses are increasing ad spend every quarter while the amount of clicks from shoppers is declining, driving the cost per click of each ad up quarter after quarter. If you are relying on advertising as a growth strategy, you need to up your budget substantially just to get the same result. I shouldn’t have to tell you that this is not sustainable! As if this decrease in engagement and increase in cost wasn’t enough, the situation gets more dire when you consider that clicks will continue to go down as more shoppers block ads. I have an adblocker, the majority of the Smile office has an adblocker, and chances are good that you have an adblocker, too. The fact is that we as shoppers HATE to be sold to. While we might escape pushy sales people online, we now have to deal with ads that are essentially doing the same thing. That is why we block them. We want to browse the internet without a pushy salesperson following us around. Don’t believe me? Here is some statistical proof for you as well. "In 2017 28.2% of American internet users had adblocking software on their desktop." Every year adblocker usage becomes more popular, and according to Digiday, adoption grew by 30% last year. eMarketer even reports that this rapid growth has brought desktop adblocker usage up above 28%. But things are not that bad...right? Even with the facts right in front of us, there are still some people who are unwilling to accept that things are changing. There are two common push backs I get when talking about the rapid adoption of adblockers. The first is that adblockers are not used on phones, which means brands will always have a place to advertise. The second is that it does not matter if people are blocking them because some brands still get great click rates on their ads. Let’s break these two objections down even further. This statement may have held some weight 2 years ago, but it is simply not true anymore. Adblocker adoption is actually growing faster in mobile browsers than it is on desktop especially in emerging markets like China and India. "Mobile adblockers were used on 11.8% of U.S. mobile browsers in 2017." That fast adoption rate has already translated into 11.8% of American mobile browsers using an adblocker. Advertising on mobile may be more safe than desktop, but it is still a major threat to retailers everywhere. Objection 2: "I still get clicks, so I'm not worried"
We’ve already established that shoppers do not want to be sold to anymore. With so much information on any product or brand so readily available online, there is no need for a consumer to rely on being told something directly by the brand. We can look up articles, watch an unboxing video, look at reviews, or ask our friends. These factors mean we are trending towards a no-ad society. So the fact that your ads are getting clicked doesn’t really mean anything, especially when you dig into the unfortunate truth of why it’s happening. Above is the results of a survey conducted by HubSpot, where they asked people to explain why they clicked on the last ad they did. I have highlighted the ones I found most interesting: 34% of respondents said they clicked on an ad by mistake, and 15% said they were tricked into doing it. With this data in front of you, it’ clear that those clicks you are seeing are likely not of the quality you think they are. With all of these factors at play, the future of online ads is not looking good for retailers. With a huge influx of businesses looking to buy ads and a declining population of people willing to pay attention, they are becoming increasingly expensive with a worse reach than ever before. Even running a promotion or discount isn’t really an option. Trends show that this is just as ineffective as ads, which means you need another plan if this is what your growth is based on next year. While ads and promotions create one-time spikes in sales, they do not help better your business in the long run. They provide a quick win at a steep cost (that is only getting more expensive). The true way to create sustainable growth is by ensuring that every shopper who makes a purchase, and every person who interacts with your brand becomes has bought into your community. A brand community is a collection of people who are invested in more than just the sales and transactions of a business. They have become a part of who the brand is and are craving a sense of belonging. Building a community ensures that you have your existing customer base engaged, making repeat purchases, and even bringing you more members in the future. It is a self sustaining cycle that is helping many of today’s top brands grow. 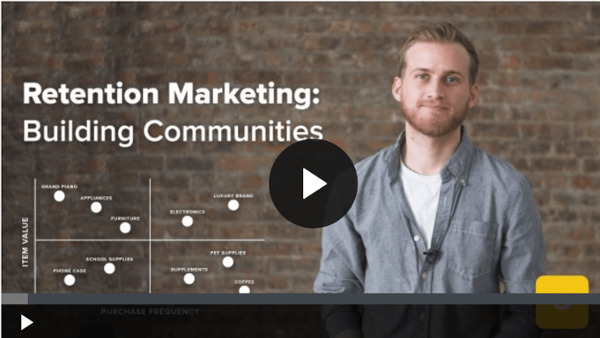 Building a brand community is a form of retention marketing. This strand of marketing is focused on maximizing the value of existing customers instead of solely focusing on the creation of new ones (like with ads). This approach to marketing has been hailed by many experts as the way of the future. The Harvard Business Review published a lengthy report on the economics of ecommerce and online loyalty stating that a 5% increase in your customer retention rate can have 90% increase in store profitability. With the increase in costs and ineffectiveness of ads, acquisition channels are becoming harder to use, and should not be considered a growth strategy. Take your favorite brand for an example. I’ll bet you didn’t make your last purchase there because of an ad they sent you or a steep promotion they were running. When you look at in this context, it’s easier to understand that you should be treating acquisition efforts as an initial investment into your long-term, ongoing retention strategy. How do I start building a community? Since I won’t be able to give you a full lesson on building a brand community in the limited words I have here, I will just give a quick summary and link you to other resources you can use. If you have more specific questions, you are always more than welcome to reach out to the Smile team, or to myself on Linkedin for advice. Building a brand community is all about value-add marketing. You need to be giving something to your potential customer that goes beyond just the transaction of the sale. Value-add marketing is about providing value to your potential customers above and beyond the sale or transaction you are seeking. While there is no one right way to start your value-add marketing initiatives, what you decide to do will become the backbone of your community building efforts. Building a strong brand community is easy when you break it into its three most basic parts. You need to have people opt into joining it, you need the people who have joined to see value and continually engage, and finally you want the advocates you create to share that community with others. This particular image has a few rewards program types that assist in each stage, but you can overlay any of the community building strategies to this framework. The goals are to get people to opt into joining your community (like subscribing to a blog). Then you want them to engage in actions that are important to getting a customer to become more invested (visiting your blog weekly). Finally, you want to create a reason to share (quality/shareable content). If you create this cycle, you are creating a growth strategy that does not rely on pouring money into a strategy that is becoming less effective every year. Instead, you create a cycle that becomes more and more self-reliant over time instead of contributing to the general public’s distaste for ads. Is your business ready for the fall of advertising? Cure your addiction to online advertising. Learn how the world's best brands have changed the way they grow by focusing on a brand community.